Recently, a visitor to site asked the question “How do you know what date that is?” On all the blogs we talk about features or buildings being ‘late 1st century’ or ‘early 3rd century’ etc. but we have never explained how we come to these conclusions… until now. There are three main dating methods that we use on this site. Initially we will use finds to do what we call spot dating. Pottery provides most of these dates. Ceramics specialists can identify different fabrics (the material the pot is made from) and forms (the shape of the vessel) from pot sherds often just by looking at them, giving an instant date range for the context in which they were found. Fragments that they don’t recognise can be compared to reference collections to quickly provide a date. Each different type of pottery is produced from a different clay, with different inclusions (things that are added to it), by different potters, in different kilns and at different times. As such there are hundreds of types of Roman pottery that can be tightly dated and in turn these can be used to date contexts on site. The same can be done with coins, small finds (such as brooches and pins) and ceramic building material, although these are usually less common. Another dating method that you hear a lot of talk about is 14C dating (or radiocarbon dating). This is a scientific method that measures the decay of carbon-14 in living organisms after they die. The amount of carbon-14 left in organic materials (such as bone or charcoal) can be used to tell how long ago the organism died, and therefore how old the remains are. Archaeologists do employ this technique for dating, and will collect environmental soil samples and articulated bone for this purpose. Unfortunately, carbon dating is expensive and time-consuming, and provides a very broad date range of hundreds of years in some cases. As such MOLA mainly uses this technique on sites where finds are sparse. 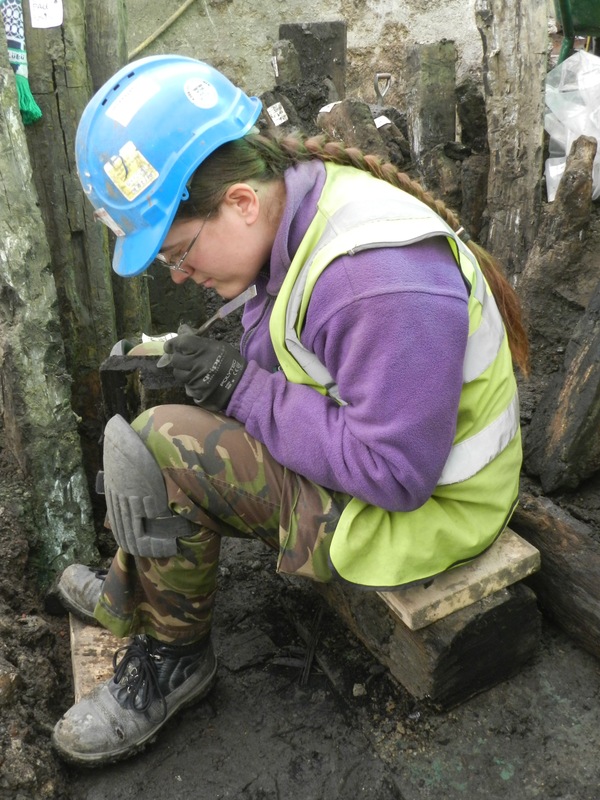 However, on Walbrook sites we have something even better to use: dendrochronology (tree-ring dating). Every year growing trees will expand by producing a new growth ring. These rings will vary in width depending on local climate factors, and trees in the same area will show similar patterns of wide and narrow rings. By comparing large reference collections of currently growing trees, timber in buildings or ships of known construction dates, and archaeological timbers, we can see a continuous sequence of growth ring variation stretching back ten thousand years in some areas. Any new timbers that we discover within this range can be compared to this sequence in order to give the exact calendar year that the tree was cut down in. 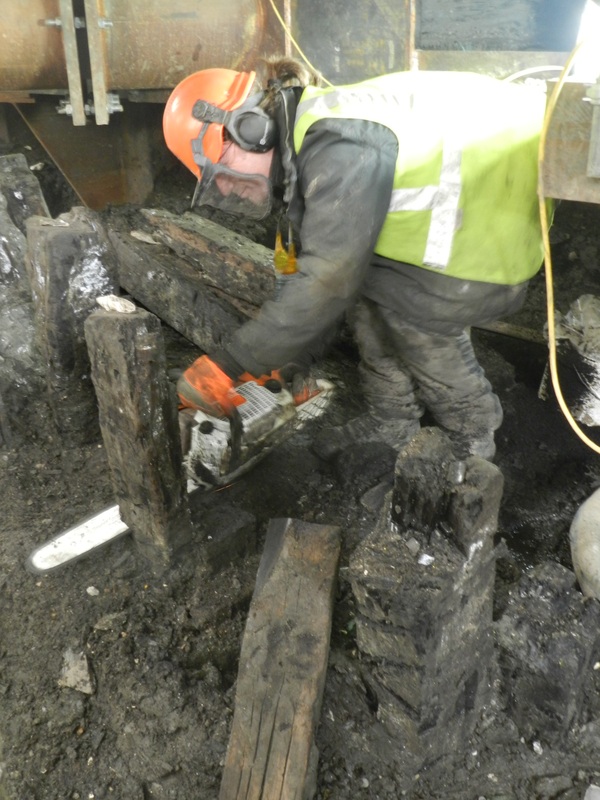 Although we have over 4,000 timbers from our main excavation, only a fraction are suitable for dendrochronology. In order to establish a statistically significant match, we only sample timbers with more than 50 visible growth rings. Timbers that have signs of re-use are not sampled as the dates they give will relate to when the tree was cut down, and not to when the structure they were reused in was built. Additionally, we will only know the exact year that a tree was cut down when sapwood (the soft outer part of the tree) and bark are present. Unfortunately, these are often stripped off when the wood is prepared for use. Nevertheless, dendrochonology provides the most accurate possible dates for structures, and is invaluable for determining their sequence. Dendrochronological dates from a drain in the site at No.1 Poultry provided the earliest evidence for the settlement of Roman London, pushing the date back to just four years after the Romans invaded in AD 43. Or for a more wider overview click here.